This charming pair date from the beginning of the 20th century and were made by the Howes Co., Boston. They are in useable condition. The eye of each is set with a glass orb through which the flames flicker. Occasionally we have owls but never before geese. The surfaces have been burnished and blackened The cast-iron log holders have been shortened. These tall and well modelled fire dogs add a decorative accent in summer and a useful complement to your winter fires. This pair of andirons is made of wrought and cast iron. This is a French work from the 1940s. 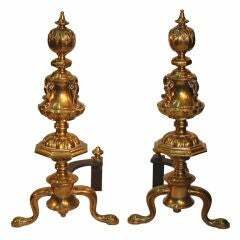 This pair of andirons are made of cast iron and iron. They are modernist, simple and strong. They are French, circa 1940. This pair of cast iron andirons represents an Evangelist. They are French, circa 1940.